Stick the bamboo skewers into the calamari to make it straight when you fry them. Mix the tempura batter as the direction from the tempura flour package and dip the calamari and the chicken into the batter then fry until golden and crisp. Using a sushi roller, place one sheet of seaweed (cut into triangles for the calamari sushi) and spread some sushi rice, sliced avocados and fried calamari (remove the bamboo skewer) then roll as you see on the picture above. 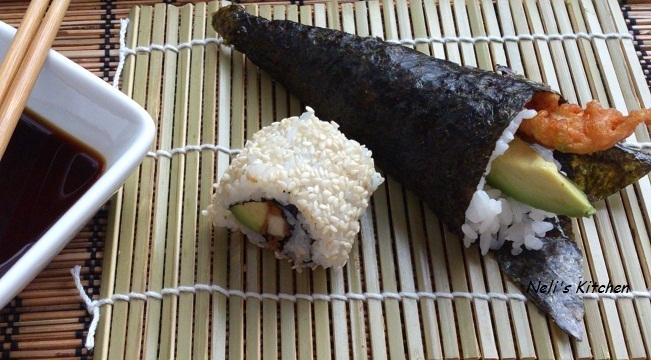 For the chicken sushi, wrap the sushi roll with the plastic wrapper and spread the rice onto it, then the seaweed. Place one fried chicken and a sliced of avocado then roll the sushi. 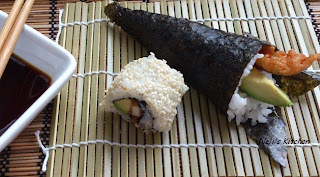 When you finish, roll the sushi into the sesame seeds then cut. Serve with wasabi or soy sauce.